The top US military official said the no-fly zone has been established over Libya, following allied forces' strikes against Muammar Gaddafi's forces. Libyan officials claim 64 have been killed and 150 injured in the action, Reuters cited. 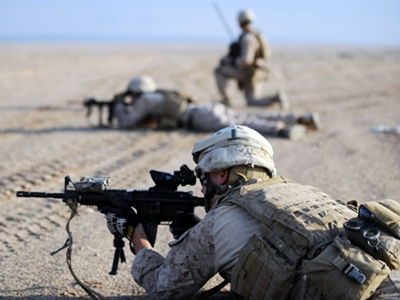 The US plans to hand over control of allied military operations in Libya "in a matter of days," either to a UK-France coalition or to NATO, US Defense Secretary Robert Gates said on Sunday. While the US will continue to play a part in military operations against Colonel Muammar Gaddafi's forces, Gates says it "will not have the preeminent role." "I think there is sensitivity on the part of the Arab League to being seen to be operating under a NATO umbrella," Gates added. US Joint Chiefs of Staff Chairman Michael Mullen told US media that Operation Odyssey Dawn was launched to carry out UN Security Council Resolution 1973 and that the coalition forces, which include US and European military, do not intend to overthrow the Libyan leader. Mullen also said the forces have succeeded in halting an offensive by Colonel Gaddafi's forces on the city of Benghazi, the country’s second-largest city and the headquarters of the rebel forces. However, in another interview with US media, he acknowledged that the end result of the action was still “uncertain” and that a stalemate was possible. 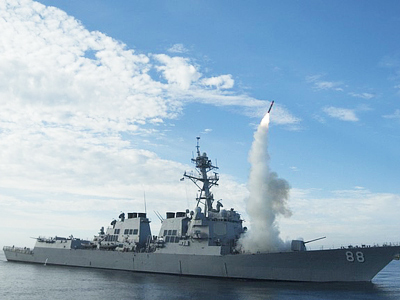 Earlier, an official at the Pentagon stated that more than 110 US Tomahawk missiles, as well as British ships and submarines, struck over 20 targets on the Libyan coast. On Sunday, Libyan state TV channel Al Jamahiriya reported that the coalition has conducted several air strikes on the Libyan capital, Tripoli. 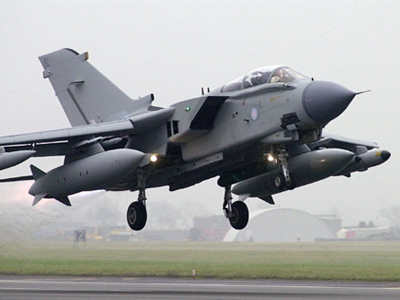 Several hours later, the UK Ministry of Defense confirmed that it had been targeting the integrated air defense system in the Tripoli area. The US military has also confirmed that its three B-12 stealth bombers have dropped 40 bombs on a major Libyan airfield. Additional reports state that anti-aircraft artillery has been heard in Tripoli, while Libyan officials claim Saturday’s attacks hit civilian targets, among them a hospital in Tripoli and a fuel storage depot in Misurata. 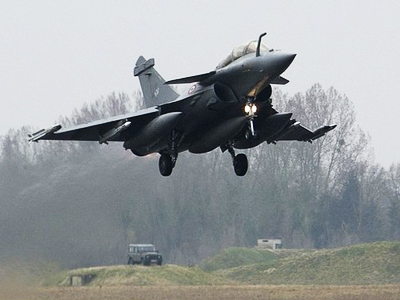 On Saturday afternoon, French jets attacked Libyan military vehicles, following which Libyan TV reported that Gaddafi’s missile defense troops shot down a French plane over Tripoli. However, France’s General Staff denied the claim, saying that all French planes returned safely to base. The French President ordered planes to patrol the skies over the city of Benghazi, to prevent attacks against civilians, where Government troops had reportedly been carrying out attacks throughout the day. Top officials in Europe and the US sought to defend the decision to attack. 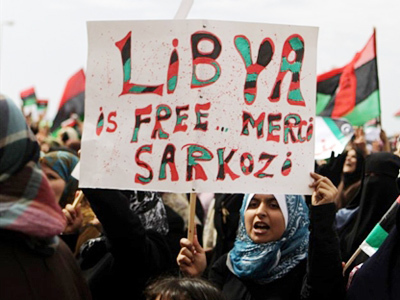 US President Barack Obama faced a delicate balancing act when he pledged support to the international effort to protect Libyans, while seeking to assure that the US involvement would not echo its invasion of Iraq. "We cannot stand idly by when a tyrant tells his people there will be no mercy," he said on Saturday during a visit to Brazil, also vowing that the US would not deploy ground forces in Libya. US Secretary of State Hillary Clinton chimed in, assuring that the US would not lead the operation, despite rising fears that the military action could grow into something more than just an effort to protect civilians. “We did not lead this. We did not engage in unilateral actions in any way, but we strongly support the international community taking action against governments and leaders who behave as Gaddafi is unfortunately doing,” Clinton said on Saturday. "We promise you a long war,'' Gaddafi said. Meanwhile, Gaddafi forces’ tanks and troops have entered the rebel-held city of Misrata, where local residents have reported casualties as a result of the shooting, according to Reuters. ­Aircraft from Qatar are reportedly moving into position near Libya to participate in military action. Qatar is sending its warplanes to take part in the offensive against Muammar Gaddafi’s violent crackdown on rebels.